Every gambling legend start with "Someone said..."
We all know some myths. We know Greek and Roman myths and legends. We know some about our neighborhood. But there is another type of myths, which is called a gambling legend. How do we receive the myths? Usually, in the gambling world it is something like somebody committed a suicide because he lost in the casino game a couple of bucks, or he wore two different socks, when he won, so now it is good luck to wear different socks, when you go gambling. You see how easily we can create the myths? Or as it happens how the underage jackpot winners push the lucky number and he is not given their winnings. It happens with the slot machine legends, which appear as the mushrooms after rain. The myth says there is a camera above each slot machine, and there is a man in the room, full of the monitors of the slot machines and he is the one, who decides who will hit the jackpot. The reality says that all machines are independent and operate without human help. It is the same with the jackpots. Do not play at the machine, where recently the jackpot was hit. Well, I have to notify you that it is a myth, as the random number generator does not depend on anybody, so the jackpot can be hit soon after the previous one. Another thing is with online casinos. Enjoying games online yore trapped into a virtual world of gambling where you play usually alone without meddling of other players. Just find the casino and make a few click. Modern technologies make it so simple! Go and play the slot machines, which were not played. Sad day, when you figure out that it is not true. Again, it is a random number generator or RNG, which is in charge of it. Actually this machine can have around 25,000,000 combinations. 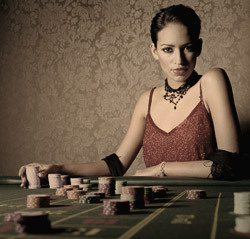 It is just like the roulette myths, "Somebody said that possible it could have happened under specific circumstances." Later the supposition is replaced by narration. Be prepared. If you use your club card to play, the machine's payoff will be less. It is also ridiculous, as the slot machines cannot be programmed for winning or losing. They were easy to violate because they were mechanical, now it is all electronics. The temperature of the coin make a difference. No it does not, because the machine does not care, whether you were breathing at it or not. It is a machine, which is very difficult to break, especially when there are cameras and guards around. So, you see that many gambling legends appear just because of ignorance, not because it happened to somebody, but because somebody thinks it is that way.